In 2005, after a long series of meetings involving the Stokesley Parish Council, SPIOTA and the newly formed Stokesley River Leven Group it was decided that the internationally acclaimed River Research Centre should be invited to advise on what could be done. The stretch of river covered in the exercise lies between the flood control gates of the Flood Relief Channel on the north and south of the town. The Flood Relief channel consists of a length of man-made channel between the Leven coming from Great Ayton and the Broughton Beck which, in itself, has been widened to river status where it passes Stokesley. This section then rejoins the River Leven below Stokesley whence it continues through Hutton Rudby and proceeds to join the River Tees near Yarm. The Flood Relief Channel is within the care of the Environment Agency, as are all rivers in the UK. Therefore all works to the river system must be referred to the Environment Agency for approval before implementation. The EA care is mainly related to flooding but also covers general environmental features, wildlife and nature. 1.Potential recreation area on the river banks just west of Town Bridge. This area needs constant attention to control weed and plant growth which entirely changes the nature of the river in summer time. Creation of an area for public use could create the right conditions for continuous maintenance. The Environment Agency requires the retention of a passage for otters along the river banks and under the Town Bridge. 2. Footpath on south side. This was installed by the Parish Council at a single concrete slab width without full foundation. The condition has deteriorated, slabs are uneven and cause tripping, some sliding river-wards. 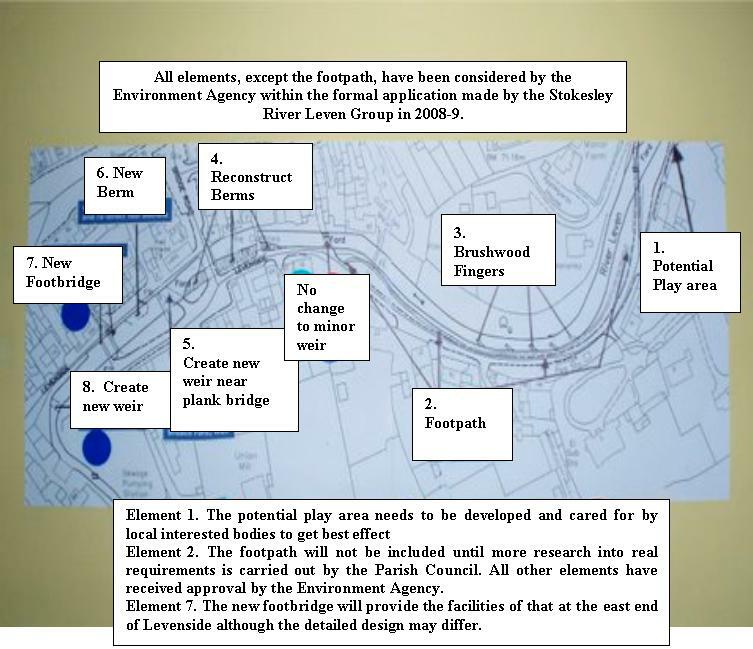 This element was not included in the application to the Environment Agency and has now been excluded as an element for this project. As a lot of it is within 5 feet of the river bank Environment Agency approvals would be needed for changes. 3. Brushwood Fingers installed in the river on the south side by Levenside cottages. The object is to narrow the river where it sweeps round the bend with a build up of silt to encourage plant growth and protect the bank structure that is being eroded in this stretch. It is a River Restoration Centre recommendation. 4. Improvement of the berms on the south side of the river to give them a drainage fall, replant to create grassy banks rather than weed beds and, potentially, prepare for use by the public as sitting/recreation areas. Access to the berms needs to be considered. 5. Upgrade the weir at the river ford west of the Iron Bridge in Bridge Road to create a “cascade” for fish and slightly divert river flow to benefit the proposed new berm in 6 below. 6. Re-make “mudbank” on the north side, including drain outfall re-alignments, in order to create a new berm to match those on the south side. 7. Replace the existing west footbridge with one that will allow usage by mobility vehicles and easy access without steps for the elderly. This should be associated with traffic safety measures on north Levenside and better facilities for pedestrians to/from Leven Wynd. It would complement the footbridge at the east end in giving access to mobility vehicles, perambulators, and wheel chairs, and level access for the elderly. 8. Create a weir/cascade at the west end of Levenside to control the water level for items 5 and 6 above. a. Information Boards covering:- river history, flora and fauna, floods and river diversion, duck over-feeding. b. Repair of river walls on north Levenside. c. Biodiversity development in association with other organisations. Funding will be required for the Enhancement Scheme to the tune of some £75000. This may have to come from a variety of sources so that it is not yet certain whether all works could be done in one operation.